What Will It Take for Indiana to Defeat Duke? Follow Ben and the rest of the Hoosiers-United family on Twitter: Josh Wilson (@joshwilson33), Ben Malcomson (@malcomsonben), Chris Corley (@chriscorley_3), Brian Tonsoni (@Soni42), and Bill Murphy (@Williamindiana2). 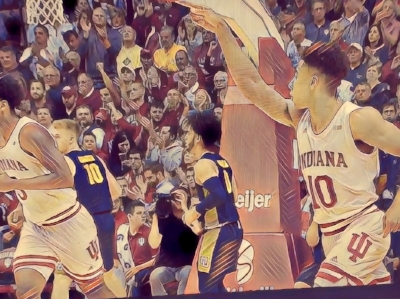 1) Containment – Due to the sheer talent level, the reality is it would be daunting to expect the Hoosiers to limit the Blue Devils as a team across the board. They must do what they can to contain the overall threat while trying to drastically reduce the threat of some of their main contributors. For example, limiting someone like RJ Barrett or Cam Reddish on the offensive end of the floor can cause some momentum and flow issues for Duke. The intent is to try to force them out of what makes them comfortable with their own game. Discomfort can create a ripple effect. Guys begin to press instead of letting their game come to them. This would give IU opportunities to create momentum of their own and force Duke back on their heels on their home floor. 2) Piece by Piece – I fully believe this game will be determined early on if the Hoosiers get out of rhythm psychologically. They shouldn’t go into the game thinking too much about the environment. They need to think of it as just another game. They need to break it down mentally into going from media timeout to media timeout as battles in an all-out war. You win most of the battles, you are going to win the war. It is important IU gets momentum early and sustains it. They could very well struggle from one “battle” (media timeout), but it is important not to let the battles lost carry over into the next segment. The Hoosiers must not be intimidated. 3) All Hands on Deck – Do not lose sight of what makes a great team. A core group that knows what they and their teammates are capable of when working together and communicating. They need high percentage opportunities on the offensive end. That starts with a strong effort defensively. The Hoosiers must capitalize on every extra opportunity they earn. I cannot stress the importance of free throw success more so than this game. The Hoosiers will be challenged if they keep it close. It is important to face that challenge from the line with confidence. Stay within themselves and play their game. As of writing this, it is unclear who will play for Indiana tonight. Gaining the services back of guys like Zach McRoberts and Devonte Green would be huge for this young team. We will find out soon enough. Either way, it will take all the pieces working together in every rotation used tonight. Make your minutes mean something. The Hoosiers have a tremendous opportunity to make some noise early on this season. IU fans want to see their team compete with the best. This is their chance to prove it.